Trying to write the perfect kiss can be fun, yet frustrating. I mean, how do you WRITE the perfect kiss? How do you make your reader feel like they are experiencing it right along with your hero/heroine? How do you get all the emotions into words? What elements, actions, are essential to write down, which aren’t? How do you write it so it’s tight, flows, and doesn’t go on for a WHOLE chapter? Weeding through a list of questions like those and then answering them is what makes writing so much fun. Finding the perfect words to make a sigh-worthy kiss pop off the pages. The touches, the looks, the words, the effect it has on the characters, how they react, what they say just before, what they say right after . . . LOVE creating! My method of research includes: Youtubeing kiss scenes from my favorite movies (And of course, practicing with my amazing Hubby.). While I watch, I write down every detail, from how they stand, hand position, lip angle, breathing . . . Although I have many favorite movie kisses, I’d have to say my absolute favorite kiss scene is between Christina Ricci and James McAvoy in PENELOPE. There’s just something so sweet, tender, about it . . . Definitely sigh-worthy! So, if you were writing–or reading–the perfect kiss, what elements would you add? What’s essential to you? Have you ever dressed up? Gone somewhere you normally wouldn’t? Talked with an accent? Bought something just to see what someone would say–how they’d react? Made a fool of yourself in the name of research? I haven’t done anything drastic while researching BOUND. (Although, hanging out with loads of teenagers and being goofy might make someone’s list). I was going to buy a pair of Jimmy Choos to walk around in, get in my characters shoes, but the price tag made my eyes roll…And, I sprained my ankle while wearing flip-flops, so . . . But, someday soon I’ll have to get my crazy on. My main girl in my WIP, LINES CROSSED (tentative title), makes a randomly-crazy list. I’m planning on experiencing the list along with her so that my writing, (feelings, thoughts, actions) is authentic. Will be interesting… Some of the items on her list: dyeing hair pink, getting a tattoo, going out dancing, kissing a stranger…. On a breath-taking research note, another of my WIP’s (IRISH DETOUR), my heroine and her BFF travel to Ireland. I like to write about exotic locations because, of course, I’ll have to go there for research. Hmm…I think I’m going to work on one where my character goes to Greece…. So, what are you prepared to do in the name of research? One of the perks of living in the “writer world” is meeting other writers and getting to read their stories. 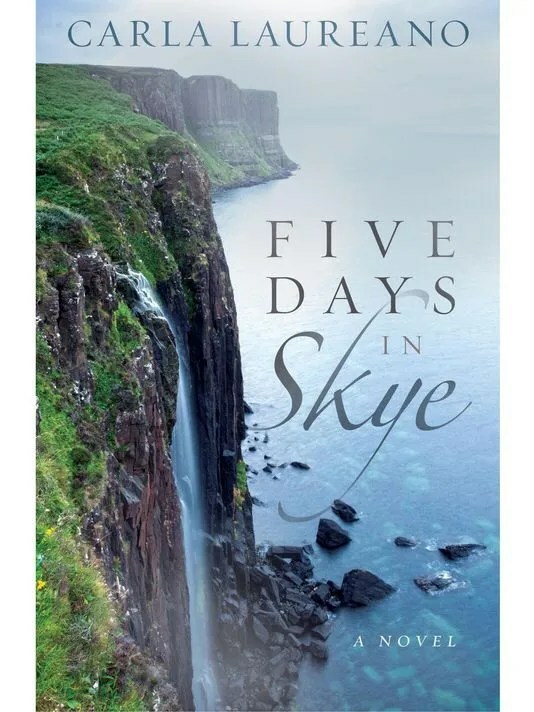 This week I had the opportunity to read Carla Laureano’s debut novel FIVE DAYS IN SKYE. It was like relaxing with a cup of coffee and watching my favorite movie. Leap Year, Decoy Bride, and P.S. I Love You all rolled into one delightful banter-filled romp . . . I loved it! And as far as my checklist for what makes a GREAT contemporary romance novel, FIVE DAYS IN SKYE pretty much nailed them all. 2. Strong, smart, feisty heroine who isn’t whiny, and likes shoes. CHECK. **Andrea Sullivan is a feisty, consultant. After punching the last client in the face (Woot! Woot! The man wasn’t listening to her “no touchy-touchy” policy), she’s being “banished” to Scotland to consult for a world-known chef that she knows nothing about. 3. Playful Banter and sparks. CHECK! CHECK! **Sparks of all kinds started flying from page one and didn’t stop. “If you can’t find me tomorrow, I’m probably hiding out somewhere so I don’t have to leave,” she murmured. “Is that so?” She turned to face him and raised her eyebrows. 4. Exotic location. CHECK. *Scottish Isle of Skye… I love learning about new places, feeling like I’m there. Carla does an excellent job of giving enough detail without making it read like a page from a textbook or guidebook. Now I REALLY want to go to Scotland! 5. Just enough “serious” to get me thinking, a take away thought that sticks with me even after I’ve closed the book. CHECK. 6. An ending that doesn’t skip ahead to “and they lived happily ever after and just found out they’re pregnant…” CHECK. The wedding, first years of marriage, and pregnancy/baby is a whole book in and of itself! **I’m not going to tell you how it did end, but Carla did a great job with it! **Pretty much the only thing missing from FIVE DAYS IN SKYE, are scratch-and-sniff stickers. Food was being prepared ALL. THE. TIME. My stomach growled audibly several times, which says a lot about Carla’s descriptive-sensory writing. YUM! I love to use Google Images to help me pick out outfits for my characters to wear–I like to have a picture to look at while I’m writing about a character: what they look like and what they’re wearing in a particular scene. It might not get in the novel totally, but I love to spend time on these little details…Distracting, yep! Fun, you bet! I’ve posted 7 pairs of black Jimmy Choos (and one sparkly pair just ‘cuz). Help me decide which pair Lydia will wear in the last chapter of BOUND! My “just ‘cuz” pair! So SPARKLY! Post your votes below, and may the best CHOOS win! Choosing the right name for your hero/heroine/villain can be challenging, but fun. There’s no right or wrong way to choose a name, but remember that names have meanings, origins, and POWER! 1. Does the name fit the character’s personality? You wouldn’t name your loving, sweet Granny, Voldemort…But it’s sure makes a great name for a bad guy. 3. Is the name of your hero/heroine memorable? It doesn’t even have to be unique for it to stick with people. Harry Potter is such a simple sounding name, but it’s stuck because it fits his character. Another thing, if you are going to create a new spelling for an old name, make sure you stay consistent in your spelling of the name. A great way to remember spellings of first names, middle names, last names, is to keep them all on index cards. Keep them within reach for those times when you have a mental pause, and can’t remember how you spelled Shayne/Shane. 4. Choose names that won’t annoy your readers. I tend to skip over names that I can’t pronounce…(I admit I skipped over Hermione Granger for the longest time…) Recently, I’ve been going on Youtube and seeing if someone (the author) has said the character’s name out loud so I’ll know how to pronounce it when I read it. It frustrates me when I can’t “be the hero/heroine” because I can’t pronounce my name! 5. Does your character live up to the meaning of his/her name? Names have power. If the hero of your novel is “fearless, motivated, strong”, don’t give him a name that means “stupid, lazy cow.” I love learning the meanings of names. Bible names are my favorite. In their context, the meanings are very telling as to who they are, where they’ve been, and where they’re headed. So, do you have a method for picking names, or do you just hear one you like and use it without checking to see where it comes from?